Amos & Riot Night: Without a doubt, would have to be having our single 'Parallel Worlds' played on BBC Radio 1 by Will Atkinson! It's very nice having support from many other big players in the scene, but never in a million years did we think our music would be aired on the UK's, if not the world's number one music station! Plus seeing that track being played at a lot of gigs is just simply mindblowing! If it had to be one, it would easily be Activa - Luminosity. What a comeback and for a sound that me & Paul really missed! Sean Tyas by far. Such an awesome dude and every time he plays or has a new release out, you know it's gonna be a biggie! Honourable mentions must also go to Nick Callaghan, Robbie Van Doe, Akira Kayosa, Hugh Tolland and Orla Feeney! All of the listed are bloody brilliant, both in the studio and behind the decks! That would easily have to be Chris Porter. His remix he'd done of Tilt & Maria Nayler's classic Angry Skies is one of those we can't stop and won't stop playing! Remember him sending some early demos of this over and knew from then it would be a big of a biggie! If we're talking this year, then that would be our remix on AVA White for Arman Bahrami - Nova. So much fun to work on that remix! Definitely keep an eye out for Destia! Had the pleasure of meeting him at Luminosity this year and for someone who's recently broken into the Trance scene, he's certainly come through with a bang! Full fire productions and a great dude to talk to as well! Our pal Asteroid is also one who we believe is gonna make some serious waves too! "Did you ever feel the edge of love?". Taken from our single with legendary Trance vocalist Dee Dee! So much fun working on that, plus we've got another one coming up with Dee Dee too in the new year ;) Other than our own works: "I'm surrendering to the power of a brand new day". Would have to say the best vocal of this year for sure by Aly & Fila and Sue McLaren. There's some reeeally good ones out there, some of whom, I've become really good friends with lately! So if I had to name a few; Dee Dee (who of course we worked on with Edge of Love). Otherwise, Sue McLaren, Ana Criado, Marjan, Jess Morgan and Claire Willis. Beyond Belief of course ;). Otherwise, FSOE (including all sublabels), Degenerate, Afterdark, GO Music, Titan. Not really seen any this year tbf. Twitter for sure. So much more direct! Both me & Paul use Cubase, although I use Ableton and Paul's just about getting into it as well ;). Luminosity Beach Festival by a landslide! Both myself & Paul were in attendance at this year's festival and we had an absolute blast there! Activa & Jon O'Bir open to close in Glasgow by a landslide. Just tune after tune! One for the history books and can't stop playing that set to this day! Only played in UK and Spain this year. The gigs we played in Liverpool and Ibiza really stick out as highlights for us in our career as a duo and the crowds at all the gigs we played at were something else! I (Dave) am an iPhone fanboy through and through (admittedly). Paul's all about Samsung himself. 23) Best new sound or sample that has been used in Electronic Music this year perhaps introduced first by you? Dunkirk. Anything Hans Zimmer has his hands on, he just adds his midas touch, especially if it's Chris Nolan directing! 26) Best online/PC/video game of the year that you have played this year? Don't really game much tbf. Robert Miles' passing was absolutely tragic. Amos & Riot Night: Erm, some new bits solo from me (David) and a few dual singles as Amos & Riot Night. Lined up a few collabs with some awesome producers and vocalists! Can't reveal too much now, but looking forward to kick off 2018 with a bang! 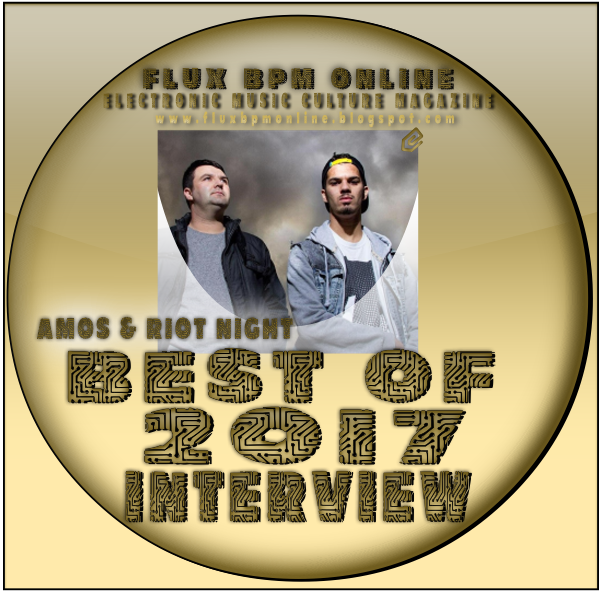 Amos & Riot Night: Big thanks to Dimitri for inviting us on board for this!